Aerate (aeration) is the term used in the aquarium hobby to force air through water so that oxygen dissolves into the water. By the use of a length of plastic or silicon tubing, airstone and a air pump to force air into the water. Water return of a external filter on to the surface of the aquarium water column. Bio-wheel which splashes the water on the surface and therefore forces aeration. In reality little air is actually dissolved as it take a bubble of air over 90 seconds to dissolve in water and long before that time it has escaped. It is the force of the water current set up by the rising bubbles that causes the top 1cm (0.4") layer of water, which is rich in oxygen, to be distributed throughout the rest of the tank. Bubbles rise and disturb the surface creating exploding bubbles which massively increases the surface area. This cause a greater air to water area so there is better exchange of gases and greater infusion of oxygen. It breaks up any bio-film that bacteria tries to make with left-over organic matter floating on the surface. It breaks up the protein rich mucus bubble nests made by air breathing fish. Therefore preventing a bio-film from forming. If you place the air-stone on the bottom of the tank as the bubbles rise it causes a current to form that ensures that the oxygen saturated water which forms at the top of the water layer is transported to the depths. 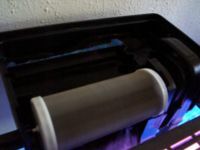 The bottom of an aquarium is where the majority of the ammonia is formed, so the aeration provides a underwater current so that good well oxygenated water gets to the bottom of a tank. This provides the nitrifying bacteria on the gravel with the vital oxygen they need to do their job. Also if you have animals like DAF frogs or bottom dwelling fish like Corys or loaches, you need to keep this bottom layer of water oxygenated. It also suppresses some forms of toxic anaerobic bacteria (which live in the gravel) which form toxic Hydrogen sulphide (rotten egg smell gas) if you disturb the substrate. It reduces CO2 in the tank which is bad for growing plants. Raises the pH of the water towards a more alkaline level (therefore may increase levels of free ammonia) so you need to ensure you have a good KH level in the water to stop the pH wandering if the aeration is intermittent or stops. See pH shock. Inexperienced aquarists may be lead into a false sense of security by having a overcrowded aquarium. The tank occupants can only survive if aeration remains on constantly. If the airpump fails, airstone becomes clogged or the electricity supply fails then the animals could succumb to oxygen starvation within a short period of time. This page was last edited on 14 February 2011, at 00:26.